Oil Painting, Major Frederick George Jackson. An unusual group of medals in the museum reveals a little of the adventurous life of Major Frederick George Jackson of The East Surrey Regiment. Two medals are unique and were awarded before he had even joined the Army. Jackson was born in 1860 in the quiet country town of Alcester, where his grandfather was rector. On leaving school, he went out to Australia and worked on a Queensland cattle station for three years where he also learned to handle and break horses. Here he started his life of travelling by a trip in the Australian Desert. On returning home, he read medicine at Edinburgh University, but did not qualify. It was while he was a medical student that Frederick Jackson plunged into the icy waters of a loch at Linlithgow on 1st January 1885 to rescue a 17 year old girl from drowning. For this he was awarded the Royal Humane Society’s Bronze Medal. Two years later, he sailed across the Atlantic in a whaling ship for a voyage to Greenland. 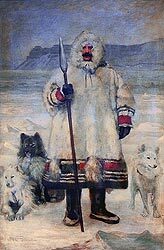 He then made a preliminary expedition across the Great Russian Tundra to Archangel and then on to Lapland in mid-winter. This experience in the Arctic inspired Jackson to make an attempt on the North Pole from Franz Josef Land to the north of Russia. After some further expeditions to gain experience and to test equipment, he found a patron for his Polar project in Alfred Harmsworth, later Lord Northcliffe. Jackson organised and led the Jackson-Harmsworth Expedition which sailed for Franz Josef Land in 1894. A base was established at Cape Flora in the south and the next two years were spent in exploring Franz Josef Land, and in surveying and mapping. On 17th June 1896 the Norwegian explorers, Nansen and Johansen, arrived at the Cape Flora base from their own attempt ton the Pole. After incredible dangers and hardships, they had hoped to reach Spitzbergen by Kayak en route for Norway, but it was then too late in the year. They were hospitably received by Jackson’s expedition with whom they stayed for seven weeks. Rather than spend a fourth winter in the Arctic, the two Norwegians were glad to avail themselves of a passage home in the Expedition’s supply ship, The Windward. During their third season exploring the innumerable small islands of Franz Josef Land, the Jackson – Harmsworth Expedition completed the survey of the western part of the archipelago, but a further journey north was made too late in the season and they had to turn back on account of the ice. In September 1897, the Expedition returned to London, having covered about 1,140 miles and added about 500 miles to the chart of Franz Josef Land. During the next year the affairs of the enterprise were wound up. No sponsors for further Polar exploration was forthcoming, and Jackson found himself nearing forty and with no occupation. For his services to the Norwegian explorers, Jackson was awarded the Norwegian Order of Knight (First Class) of the Royal Order of St Olav in 1898. It was in this year that he first married. The South African War broke out in October 1899, and Jackson saw his opportunity to be of service. He applied to join the Army, and in March 1900 was granted a direct captain’s commission in the 5th (Militia) Battalion The Manchester Regiment. He was appointed to train a Mounted Infantry Company, and here his experience with horses in Australia came into its own. He served with them in South Africa, being Mentioned in Despatches and receiving the Queen’s South Africa Medal with five bars. In 1905, Captain Jackson was transferred to the 4th (Special Reserves) Battalion The East Surrey Regiment, and in January 1910 was promoted Major. In October 1914, Major Jackson, who was then 54, was sent with a draft of two officers and 65 other ranks to the 1st Battalion in action near La Bassee in France. All the company commanders had been wounded, and Major Jackson temporarily took command of the two forward companies in the advance towards La Bassee. It is indeed remarkable that an officer of his age (in fact, seven years older than his commanding officer!) should be sent to a battalion in the line, but a man of Major Jackson’s adventurous spirit would not have missed such an opportunity for active service. He was later invalided home and commanded the Southwark Recruiting District for more than two years. After his wife died in 1918, Major Jackson went abroad again to command prisoner of war camps in Germany. He was awarded the 1914 Star, British War Medal and Victory Medal for his services in the Great War. Jackson now transferred his interests from the Arctic to Africa. In the 1920s he crossed the Continent from east to west, travelled across Mashonaland, Matabeleland and Northern Rhodesia and trekked across Urundi and Ruanda. From Lake Kivu he crossed the Congo Forest to the Lualaba River, visited the sources of the three great rivers of Africa, the Zambesi, the Nile and the Congo, and followed the whole length of the last named river to the sea. He was a member of a League of Nations Commission to inquire into slavery, said to be practised in Liberia. There was no end to his interest in exploration and travel. At the age of 69 he married for the second time and settled down to writing. He was the author of three books, ‘The Great Frozen Land’, ‘A Thousand Days in the Arctic’ and ‘The Lure of Unknown Lands’ and wrote numerous papers and articles. He was a man of phenomenal energy and wide interests. He listed as his recreation big game shooting, fishing, hunting and polo. Unorthodox to the end, he spent his last years with his wife in a houseboat, called ‘Afterglow’, on the Thames. Major Jackson died in 1938 at the age of 78, having led a full, active and useful life. After the Second World War a memorial to him was unveiled in St Paul’s Cathedral.